The perfect summer salad has grilled ingredients served warm served with fresh raw veggies. 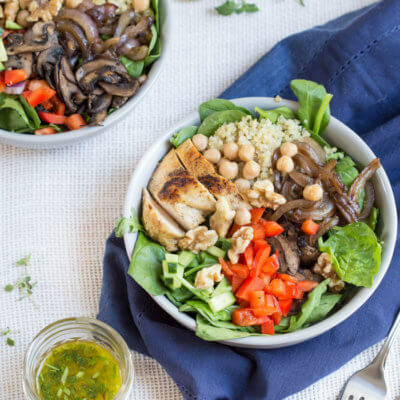 This Mediterranean Quinoa Chicken Salad bowl is topped with grilled chicken, sautéed onions, mushrooms and a zesty herb dressing. In skillet, heat olive oil over medium high and sauté onions and mushrooms until fully cooked and translucent. In a mason jar or bowl, prepare dressing by mixing all ingredients together. If using a mason jar, cap it and shake to mix salad dressing. Toss salad greens with dressing and distribute among two bowls. Layer warm chicken, mushrooms, onions, quinoa, bell pepper, cucumber, chickpeas and walnuts on greens. Nutrition information includes salad dressing.